Shimmering, silvery tinsel can make your Christmas tree look dazzling and festive. It might take a bit more effort putting it up, but it is well worth it! We are mad about these fancy strands and the way they bring us back in time to traditional Christmases past. We’ll talk more about great decorating ideas using tinsel, and as a special treat, we will show you how to dress up your Treetopia Shimmering Silver Pencil tree. Invented in Germany in 1610, tinsel was originally intended to mimic the look of icicles and enhance the flickering lights of candles on the tree. To achieve this effect on a traditional Christmas tree, start by making sure all your ornaments are in place and then switch on your tree lights. Photo from Horia Varlan via flickr. CC BY 2.0. Beginning at the top of the tree, take two or three strands of tinsel at a time and place them gently on the outer needle tips. Make sure the tinsel strands are spaced evenly apart. Don’t simply place strands of tinsel carelessly or you’ll end up with clumps of tangled tinsel which makes your tree look sloppy. Do take your time and enjoy this simple, once-a-year pleasure. To add sparkle to your holiday table, fill clear glass vases and bowls with tinsel and display them as is, or add in poinsettias and hollies. 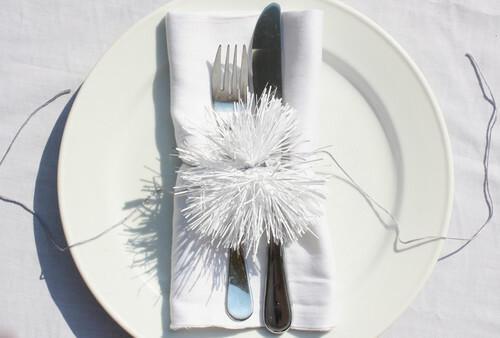 To add pizazz to your table settings, roll up flatware in a cloth napkin and wrap the bundle with a single strand of tinsel tied in a neat little bow or secure with thread and a white tinsel pompom. Around the house, you may drape tinsel around headboards and mirrors, or tack them to windows or door frames. But take extra precaution if you have young children or pets in your home. These can get snagged and cause injuries. This slim and sleek Treetopia Christmas tree is bursting with glittery light-reflecting needles, making it a tinsel-lover’s dream! With a traditional green tree, the focus is on the ornaments, but with a silver tree like this, you’ll want all of the attention on its sparkling branches. Decorate this slim tree with small colorful glass Christmas balls or with any themed ornaments, but do so in moderation to avoid overwhelming the tree. Adorning your tree with vintage ornaments creates a stylish look and is an elegant homage to the aluminum trees of the 1950’s. Christmas tree decorating need not be complicated. You can jazz up your home instantly with this radiant beauty. If you have suggestions on how to decorate your home with shiny, dazzling tinsel, share your ideas or photos with us on the comments section.